A stylish, dynamic and responsive theme suitable for many various types of website with a custom front page, which can be customized in the WordPress customizer with live preview. It comes with a full screen slider or hero section, 4 page templates, 7 widget areas including left sidebar, right sidebar, 4 footer columns plus a further full-width middle footer area. 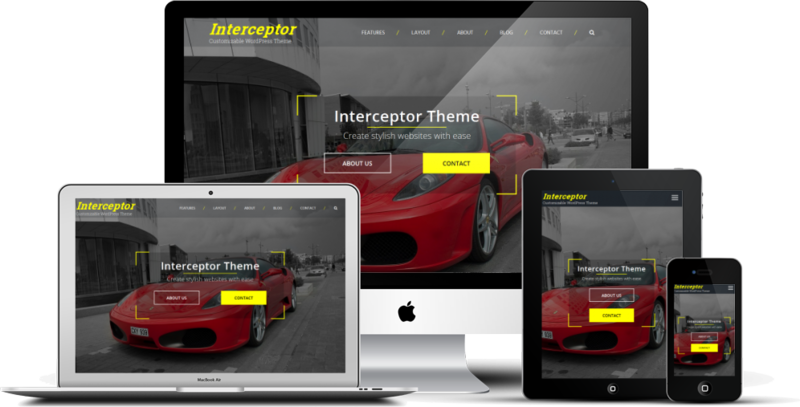 The Interceptor theme is fully compatible with WordPress and language support. The Interceptor theme is responsive so it is accessible and readable on any device. Your website visitors will see a great looking site on their phones and tablets. Interceptor comes with two different header/menu layouts and two menu styles. Start selling your products right away!